The burros at the Red Rock Canyon NCA provide a unique experience we hope you will enjoy, but please remember: they are undomesticated animals and can be dangerous. Feeding burros encourages these animals to congregate on roadways where many have been killed and injured by vehicles. Each year people are injured from kicks and bites from burros, as well as from automobile accidents caused by burros on the roadway. 1. Pick a safe place to stop; pull completely off the roadway. 2. Observe the burros from a distance. The safest place is from your car. Do not try to coax them closer with food. 3.These animals can bite and kick. Do not feed them, stand close to them, or get on their backs. 4. Drive carefully and be cautious when you see animals on or near the road. Burros may step out in front of your car unexpectedly. The burros you see in the Red Rock Canyon NCA survive high temperatures and long periods of time without green forage by using shade and being most active in early morning and late afternoon. They eat grasses and shrubs. They are generally less than half the size of a horse. The average weight of an adult is 400 pounds with the males (jacks) being slightly larger than the females (jennies). Burros evolved in the deserts of northern Africa where the average rainfall is about two inches a year. Two populations of burros from northern Africa that were separated from each other by natural barriers are attributed with being the ancestors of today's feral burro in the American southwest. These are the Nubian and the Somalian. The Nubian's characteristics are a black stripe across the shoulders and another down the middle of the back giving the appearance of a cross when viewed from above. The Somalian has leg stripes on both front and hind legs resembling a zebra's markings. These characteristic differences may be seen in the numerous individual burros which freely roam Red Rock Canyon NCA. Early explorers brought both horses and burros to the New World. Some of these animals were released or escaped to the deserts of the Southwestern United States and Mexico. With the discovery of more gold and silver in the 1800s, miners brought more burros with them. These animals added to the small early populations and began to breed and increase in numbers. At one time more than 10,000 wild burros were found in California, Arizona and Nevada. Today there are about 8,000 burros in the western United States. Burros have only two natural predators. The mountain lion preys on all burros. The coyote usually preys on the young, very old, crippled or sick animals as nature's way of maintaining a healthy population. With today's reduced number of mountain lions, there are few natural predators to check the growth of wild burro populations. The Wild and Free-Roaming Horse and Burro Act (Public Law 92-195), passed in 1971, stated that the Bureau of Land Management should manage wild burros with other plants and animals in the environment. 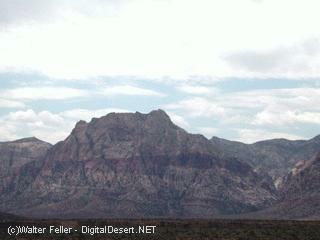 The desert in Red Rock Canyon NCA is a very fragile area that is hard to restore when damaged. The BLM is currently managing the burros within Red Rock Canyon NCA so that there will always be burros, but not so many that other animals and plants can't also share the area.